Background/Aim: The aim of the study was to determine the clinical and radiological effects of septorhinoplasty and the change in serum Vitamin D levels on snoring. Patients and Methods: Sixty patients who attended with complaints of snoring, difficulty in breathing through the nose, and nasal deformity were included in this prospective study. Patients who only underwent septorhinoplasty were defined as Group 1, patients who underwent septorhinoplasty and were administered Vitamin D were defined as Group 2, and patients who were administered Vitamin D without undergoing septorhinoplasty were defined as Group 3. Results: In Groups 2 and 3, changes in the anteroposterior diameter of the air column, column of the airspace, and thickness of the soft palate and the uvula were statistically significant. Snoring decreased significantly at every postoperative follow-up in all three groups. This decrease was significantly higher in Group 2 than in Groups 1 and 3. Conclusions: We determined that one reason for snoring may be Vitamin D deficiency. Replacement of Vitamin D with removal of the upper respiratory tract problems may prevent snoring in patients with snoring and Vitamin D deficiency. Currently, sleep disorders stand out as a common medical problem. Some of the changes that occur because of upper airway problems can cause sleep disorders. The clinical presentation in patients can be observed in many different forms, from simple snoring to an obstructive sleep apnea syndrome (OSAS)., An airway constriction that occurs because of relaxation of the soft tissue anatomy in the oropharyngeal region increases the speed of airflow during sleeping. Air that quickly passes from a narrow passage results in loud sounds due to the vibrating unsupported tissues of the upper airway. The treatment of sleep disorders requires a multidisciplinary approach, including surgical and medical treatment. Septorhinoplasty, turbinate surgery, palate surgery, orthognathic surgery, and genioglossal advancement can all be utilized for surgical treatment. OSAS was reported to be used twice as often in patients with nasal obstruction. Therefore, surgeries that improve nasal patency have an important role in the treatment of snoring. Septorhinoplasty can benefit patients with OSAS and nasal obstruction, particularly patients with a body mass index (BMI) <30. Septorhinoplasty does not provide complete correction of snoring in conditions that are not due to problems only in the nose, such as sagging of the soft palate and bulking of the soft palate–uvula tissue and/or the tongue. Therefore, elimination of upper airway problems with correction of current hypotonia in the muscles of the soft palate is required in the treatment of snoring. Vitamin D is a vital vitamin that has antiproliferative, prodifferentiative, proapoptotic, and immunomodulatory functions, and it also assists in bone growth and development. The relationship between low Vitamin D levels and prostate cancer, breast cancer, cardiovascular mortality, osteoporosis, allergic diseases, diabetes, and multiple sclerosis has been reported in epidemiological studies., Other findings that are observed during Vitamin D deficiency include a decrease in the muscle tone. Although it has been claimed that higher mean platelet volume and lower Vitamin D levels are observed in patients with snoring/OSAS,, an assessment of the effects of serum Vitamin D levels on snoring has not yet been elucidated. On the other hand, an improvement in polysomnography has been demonstrated with functional septorhinoplasty in the treatment of OSAS; however, supporting these findings as clinical and radiologic is not described in literature. To the best of our knowledge, changes that occurred after improving Vitamin D deficiency was not investigated in any of the studies. The aim of the study was to determine the clinical and radiological effects of septorhinoplasty and the change in serum Vitamin D levels on snoring. Patients who attended our clinic with complaints of snoring, difficulty in breathing through the nose, and nasal deformity between 2014 and 2015 were included in this prospective study. Patients who had ≤2 positive points in the STOP BANG questionnaire (Snoring, Tiredness, Observed apnea, and high blood Pressure combined with BMI, Age, Neck circumference, and Gender) [Table 1],, a septum deviation, an inferior turbinate hypertrophy, a closing of the nasal passages, Vitamin D levels <25 ng/mL, and aged between 18 and 50 years were included. Patients with this problem and who had two or more positive points among the eight categories evaluated in the STOP-Bang questionnaire and/or patients with apnea were excluded. The patients were evaluated preoperatively using the Friedman palate and tonsils position staging system. Patients with a palate position of 1–4 and a tonsillar hypertrophy of 1–2 were included. The nasal obstruction evaluation (NOE) scores were evaluated preoperatively and postoperatively at 3, 6, and 12 months. Patients with a score ≥3 postoperatively were excluded from the study. A lateral cephalometry was performed to identify problems in the maxillomandibular relationship. Patients who had short distance between gonion and menton points and/or distance between hyoid and mandibular plane >25 mm and/or sella-nasion-basion (B point) angle <76° and/or mandibular length <70 mm and/or the intermaxillary space length <75 mm and/or cranial base angle <127° were excluded. In addition, patients who had micrognathia, retrognathia, macroglossia, adenotonsillar hypertrophy, hypothyroidism, mandibular hypoplasia, occlusion disorders, high blood pressure, BMI ≥30, neck circumference ≥40 cm, and smoked cigarettes and/or used drugs other than Vitamin D were excluded from the study. The study was approved by the local ethics committee. Patients were given written and verbal consent. All procedures were performed by the same surgeon. Sixty patients were randomly selected according to the outpatient application orders so that there were twenty patients in each group. The patients were divided into three groups as follows: patients who only underwent septorhinoplasty were defined as Group 1, patients who underwent septorhinoplasty and were administered Vitamin D were defined as Group 2, and patients who were administered Vitamin D without undergoing septorhinoplasty were defined as Group 3. A complete blood count and thyroid function tests were performed. BMI was calculated, and serum Vitamin D levels were measured. Calcium levels of patients were followed and patients with abnormal calcium levels were excluded from the study. In addition, patients who lost weight >5 kg after being included in the study were excluded. A nasopharyngeal paranasal magnetic resonance imaging was performed for all patients before initiating the Vitamin D treatment and 3 months after initiation of treatment. A vertebra was determined as a point of origin. According to the vertebrae, the anteroposterior diameter of the air column, column of the airspace, thickness of the uvula and the soft palate, and the epiglottis position were measured. Preoperative and postoperative snoring scores were evaluated with Berlin questionnaire [Table 2]. In total, three categories are considered in the Berlin questionnaire; if two or more categories are positive, then the patient is considered to be at a high risk for OSAS. Although patients who gave positive responses to category 1 of this questionnaire and negative responses to categories 2 and 3 were included in the study, patients with apnea were excluded. Open septorhinoplasty and nasal valve surgery were performed on all patients in Groups 1 and 2, and 300,000 U of Vitamin D was administered orally 1 week after the surgery. Subsequently, Vitamin D treatment (5000 U/day) was continued. 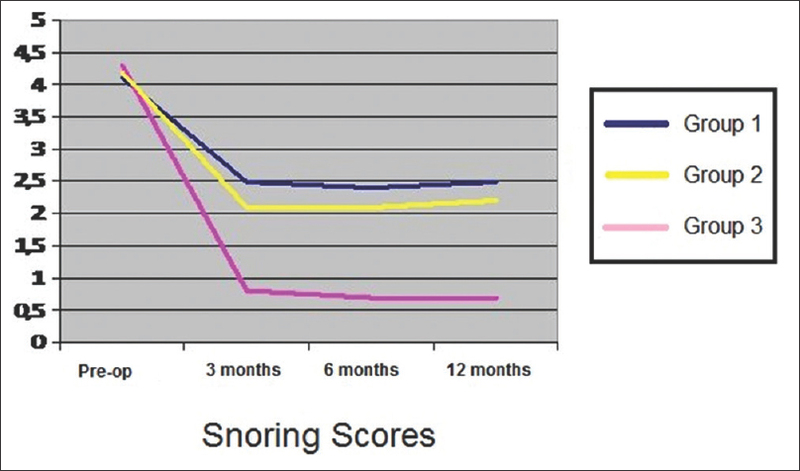 Snoring scores were determined by performing the Berlin questionnaire category 1 assessment test preoperatively and postoperatively at 3, 6, and 12 months. The statistical significance of the differences between the mean values was analyzed using SPSS 24.0 (IBM SPSS Inc., Chicago, IL, USA) statistical software. Repeated measures for ANOVA and Bonferroni adjusted sample test in paired samples were used to compare the reduction in snoring scores between the groups. Paired t-test was used to compare the anteroposterior diameter of the air column, column of airspace, thickness of the uvula and the soft palate, and change in the position of the epiglottis at pre- and post-Vitamin D treatment. The level of significance was accepted as <0.05. Sixty patients (38 males and 22 females) were included in the study. The mean age of the patients was 28, 26, and 34 years in Groups 1, 2, and 3, respectively. The mean follow-up period was 16 months. No surgical complications were observed. The mean BMI was 24.9, 25.7, and 25.1 in Groups 1, 2, and 3, respectively. The mean preoperative levels of Vitamin D were 13.1 ng/ml in Group 1, 11.6 ng/ml in Group 2, and 11.9 ng/ml in Group 3. After replacement of Vitamin D, the mean serum Vitamin D level was increased to 83 ng/ml in Group 2 and 87 ng/ml in Group 3. The average preoperative snoring score was 4.1 in Group 1, 4.3 in Group 2, and 4.2 in Group 3. At 3-month postoperatively, this score was 2.5 in Group 1, 0.8 in Group 2, and 2.1 in Group 3. At 6-month postoperatively, the average snoring score was 2.4 in Group 1, 0.7 in Group 2, and 2.1 in Group 3. The average postoperative snoring scores were 2.5 in Group 1, 0.7 in Group 2, and 2.2 in Group 3 at 12-month postoperatively [Figure 1]. In Group 1, no change was observed in the anteroposterior diameter of the air column, column of airspace, and thickness of the uvula and the soft palate. In the Vitamin D treatment groups, the average anteroposterior diameter of the air column was increased by 1.31 mm in Group 2 and 1.29 mm in Group 3. The average column of the airspace was increased by 5.7 mm2 in Group 2 and 5.8 mm2 in Group 3. The average level of the uvula increased by 1.42 mm in Group 2 and 2 mm in Group 3 [Table 3]. The epiglottis level increased in one patient in Group 2 and it was increased by 4.36 mm in two patients in Group 3; however, this finding was not observed in other patients. The average thickness of the soft palate was decreased by 1.17 mm in Group 2 and 1.14 mm in Group 3 [Table 3]. Changes in the anteroposterior diameter of the air column, column of the airspace, and thickness of the soft palate and the uvula were statistically significant [Figure 2]. Snoring decreased significantly at every postoperative follow-up in all three groups of patients. This decrease was significantly higher in Group 2 than in Groups 1 and 3. On examining sleep physiopathogenesis, a decrease in the tone of the dilator muscles of the upper air duct, relaxation of the muscles, and narrowing of the upper airway were observed during sleep at the rapid eye movement phase. Therefore, breathing became more difficult. When the tongue slides to the posterior pharyngeal wall, an obstruction or narrowing occurs. Snoring is a major risk factor and is one of the most important symptoms of OSAS. The prevalence of snoring ranges from 5% to 50% in the population., Predisposing factors for OSAS are obesity, smoking, and alcohol., It has been demonstrated that obese patients with OSAS have a larger tongue and a soft palate; therefore, they have a smaller airway. OSAS occurs in the excess tissue that changes the shape and function of the respiratory tract. In addition, micrognathia, retrognathia, macroglossia, adenotonsillar hypertrophy, and nasal obstruction can also cause snoring. An improvement in the nasal airflow can change the pharyngeal aerodynamics. Therefore, surgeries that provide nasal patency are important in the treatment of snoring. The average apnea–hypopnea index decreased from 33.5 to 35.2 in patients, in whom only a septoplasty and turbinate reduction were performed. In another study on nasal valve surgery and septoplasty, this index decreased to 24.6 from 43.1. In our study, postoperative snoring scores significantly decreased in Groups 1 and 2 in which nasal valve surgery and septorhinoplasty were performed. Although it was reported that there are many factors that cause snoring, the etiopathology of the disorder is not clearly understood. Both surgical and noninvasive methods can be used in OSAS treatment. However, it has been reported that no treatment method for OSAS can ensure a high success rate without a complication., One of the causes of OSAS may be a lack of Vitamin D. Eliminating Vitamin D deficiency may help in treating OSAS. Although patients who gave positive responses to question 1 of this questionnaire were included in the study, patients with apnea were excluded. Thus, patients who suffered from only simple snoring were included in the study. It has been claimed that the use of polysomnography for the diagnosis of OSAS may be useful in assessing the results of a functional rhinoplasty. This test can be applied in patients with excessive sleepiness or insomnia, tending to depend on the day and sleep fragmentation. Although polysomnography is the gold standard for OSAS diagnosis, it is expensive and not widely available., On the other hand, STOP-Bang questionnaire for screening of OSAS in the surgical population is suggested due to their higher methodological quality and easy-to-use feature. In addition, it has been claimed that STOP-Bang questionnaire is superior to Epworth sleepiness scales, Berlin questionnaire, and STOP questionnaire in screening OSAS patients. Patients with apnea and/or a daytime sleep disorder were excluded and only patients suffering from simple snoring were included in our study. Therefore, we preferred the STOP-Bang questionnaire and polysomnography was not used. It was determined that children suffering from snoring and OSAS have a high platelet count and low serum Vitamin D levels. In another study, it was reported that the Vitamin D level is low in patients with OSAS. In another study, it was claimed that taking one 50,000 U Vitamin D supplement in a fortnight for 8 weeks can significantly decrease sleep score, sleep latency, and score of subjective sleep quality in Vitamin D recipients. Huang et al. reported that Vitamin D supplementation improves pain, sleep, and quality of life in chronic pain patients. However, changes caused by a low Vitamin D level in the body and the underlying mechanism have not been studied. In our study, although snoring was observed with a preoperative mean Vitamin D level of 11.6 and 11.9 ng/ml in Groups 2 and 3, when the Vitamin D level was >67 ng/ml in both the groups, snoring was reduced. Erden et al. reported that there is an association between high bisphenol A and low Vitamin D levels and OSAS. In another study, it was determined that adenoid volume and Vitamin D deficiency were inversely correlated in patients with adenoid hypertrophy. In addition, it was reported that Vitamin D level was lower in patients with a darker Fitzpatrick skin type. However, all of the studies which investigated Vitamin D and snoring in the literature are epidemiological surveys. To the best of our knowledge, changes in the soft palate that occurred after improving Vitamin D deficiency were not investigated in any of the studies. Receptors of Vitamin D exist in many tissues and cells, such as T-lymphocytes, breast, tissue brain, prostate, colon, gonads, muscles, and pancreas. Many problems have been observed in patients with a Vitamin D deficiency in most of these tissues. Vitamin D is responsible for the absorption of calcium, which is required for nerve transmission and muscle contraction. A relationship between Vitamin D and the muscle power structure has also been found. Vitamin D increases the tone of soft tissue and tightens it, which is observed in all muscles in the tissue. Snoring can be observed depending on the sagging of the muscles of the soft palate, particularly the genioglossus muscle. Common findings in the case of Vitamin D deficiency are diffuse pain in the muscles; difficulty in walking, sitting, and climbing stairs; and difficulty in performing movements. It has been claimed that serum 25(OH) D levels must be higher than 40 ng/ml for improving the muscle function. The adipose tissue in obese people can be the reason of low serum Vitamin D levels, leading to a greater pool of distribution. Obesity is one of the predisposing factors of OSAS, and snoring is reduced in patients after weight loss. Another benefit of weight loss may be the elevation of free and bioavailable Vitamin D in the blood, and thus, it may increase the muscle tone. Although snoring significantly decreased in all groups, the snoring score was higher in Groups 1 and 3 than in Group 2. The reason may be a noneliminated sagging of the soft palate in Group 1 and a nonreformed nasal obstruction in Group 3. Thus, oral breathing during sleeping causes increased susceptibility to obstructive apnea by increasing the oral respiratory airway resistance. We believe that a correction of nasal obstruction is an important factor in decreasing snoring; however, it is not sufficient alone. When the Vitamin D level is >67 ng/ml, the uvula and the soft palate rise and the air column space increases. In our study, we found that the thickness of the soft palate was significantly reduced. We believe that Vitamin D causes these effects by increasing the muscle tone. The epiglottis level rose in three of our patients; however, this increase was not statistically significant. These changes were consistent in the repeated STOP-Bang questionnaire findings after Vitamin D treatment. Snoring decreased in Groups 2 and 3. Patients with a NOE score ≥3 postoperatively were excluded from the study. Thus, we tried to reveal the impact of nasal patency on snoring by excluding patients whose nasal obstruction did not improve completely. To minimize the impact of tonsillar hypertrophy on snoring, a trial was performed by excluding patients with stage 3–4 tonsillar hypertrophy. Vitamin D level can be affected various medical conditions or diseases, surgical complications, or endocrinologic problems. Likewise, snoring can be affected various conditions such as obesity, smoking, and alcohol as well. Taken together, it can be claimed that just showing causality between Vitamin D and snoring is prudent, because many factors coexist between them. However, we tried to eliminate all the factors causing snoring, except for Vitamin D deficiency in this study. Changes in the muscles of the soft palate with Vitamin D treatment have not been described in the literature. When Vitamin D deficiency is corrected, the palate rises by eliminating hypotonia in the soft palate muscle, anteroposterior diameter of the air column and the column of the air space increases, and thickness of the soft palate decreases with the contraction of muscles. We determined that one reason for snoring may be Vitamin D deficiency. Replacement of Vitamin D with the removal of upper respiratory tract problems may prevent snoring in patients with snoring and Vitamin D deficiency. We thank Mehmet Uyar, MD, for his statistical analysis support. Dalmasso F, Prota R. Snoring: Analysis, measurement, clinical implications and applications. Eur Respir J 1996;9:146-59. Teculescu D, Benamghar L, Hannhart B, Michaely JP. Habitual loud snoring. A study of prevalence and associations in 850 middle-aged French males. Respiration 2006;73:68-72. Hui DS, Chan JK, Ho AS, Choy DK, Lai CK, Leung RC, et al. Prevalence of snoring and sleep-disordered breathing in a student population. Chest 1999;116:1530-6. Eskafi M, Cline C, Nilner M, Israelsson B. Treatment of sleep apnea in congestive heart failure with a dental device: The effect on brain natriuretic peptide and quality of life. Sleep Breath 2006;10:90-7. Tanna N, Smith BD, Zapanta PE, Karanetz I, Andrews BT, Urata MM, et al. Surgical management of obstructive sleep apnea. Plast Reconstr Surg 2016;137:1263-72. Friedman M, Maley A, Kelley K, Leesman C, Patel A, Pulver T, et al. Impact of nasal obstruction on obstructive sleep apnea. Otolaryngol Head Neck Surg 2011;144:1000-4. Shuaib SW, Undavia S, Lin J, Johnson CM Jr., Stupak HD. Can functional septorhinoplasty independently treat obstructive sleep apnea? Plast Reconstr Surg 2015;135:1554-65. Iİnce B, Yıldırım ME, Iİsmayılzade M, Dadacı M. Vitamin D and systemic effects of Vitamin D deficiency. Selcuk Med J 2018;34:84-9. Dadaci Z, Borazan M, Kiyici A, Oncel Acir N. Plasma Vitamin D and serum total immunoglobulin E levels in patients with seasonal allergic conjunctivitis. Acta Ophthalmol 2014;92:e443-6. Zicari AM, Occasi F, Di Mauro F, Lollobrigida V, Di Fraia M, Savastano V, et al. Mean platelet volume, Vitamin D and C reactive protein levels in normal weight children with primary snoring and obstructive sleep apnea syndrome. PLoS One 2016;11:e0152497. Erden ES, Genc S, Motor S, Ustun I, Ulutas KT, Bilgic HK, et al. Investigation of serum bisphenol A, Vitamin D, and parathyroid hormone levels in patients with obstructive sleep apnea syndrome. Endocrine 2014;45:311-8. Chung F, Yegneswaran B, Liao P, Chung SA, Vairavanathan S, Islam S, et al. 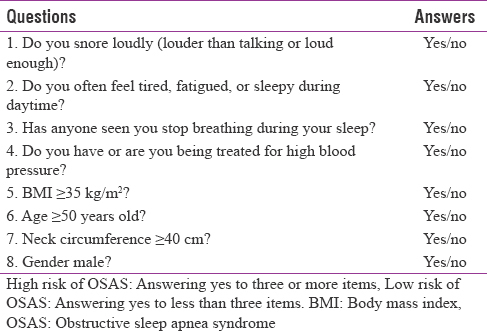 Validation of the Berlin questionnaire and American Society of Anesthesiologists checklist as screening tools for obstructive sleep apnea in surgical patients. Anesthesiology 2008;108:822-30. Friedman M, Ibrahim H, Bass L. Clinical staging for sleep-disordered breathing. Otolaryngol Head Neck Surg 2002;127:13-21. Stewart MG, Witsell DL, Smith TL, Weaver EM, Yueh B, Hannley MT, et al. Development and validation of the nasal obstruction symptom evaluation (NOSE) scale. Otolaryngol Head Neck Surg 2004;130:157-63. Battagel JM, Johal A, Kotecha B. A cephalometric comparison of subjects with snoring and obstructive sleep apnoea. Eur J Orthod 2000;22:353-65. Clark GT, Arand D, Chung E, Tong D. Effect of anterior mandibular positioning on obstructive sleep apnea. Am Rev Respir Dis 1993;147:624-9. Ivanhoe JR, Cibirka RM, Lefebvre CA, Parr GR. Dental considerations in upper airway sleep disorders: A review of the literature. J Prosthet Dent 1999;82:685-98. Young T, Skatrud J, Peppard PE. Risk factors for obstructive sleep apnea in adults. JAMA 2004;291:2013-6. Ryan CF, Lowe AA, Li D, Fleetham JA. Three-dimensional upper airway computed tomography in obstructive sleep apnea. A prospective study in patients treated by uvulopalatopharyngoplasty. Am Rev Respir Dis 1991;144:428-32. Li HY, Wang PC, Chen YP, Lee LA, Fang TJ, Lin HC, et al. Critical appraisal and meta-analysis of nasal surgery for obstructive sleep apnea. Am J Rhinol Allergy 2011;25:45-9. Bican A, Kahraman A, Bora I, Kahveci R, Hakyemez B. What is the efficacy of nasal surgery in patients with obstructive sleep apnea syndrome? J Craniofac Surg 2010;21:1801-6. Luo J, Huang R, Zhong X, Xiao Y, Zhou J. STOP-Bang questionnaire is superior to Epworth sleepiness scales, Berlin questionnaire, and STOP questionnaire in screening obstructive sleep apnea hypopnea syndrome patients. Chin Med J (Engl) 2014;127:3065-70. Baldini M, Chiapella MN, Fernández MA, Guardia S. STOP-BANG, a useful and easy tool for the screening of obstructive sleep apnea. Medicina (B Aires) 2017;77:191-5. Kerley CP, Hutchinson K, Bolger K, McGowan A, Faul J, Cormican L, et al. Serum Vitamin D is significantly inversely associated with disease severity in Caucasian adults with obstructive sleep apnea syndrome. Sleep 2016;39:293-300. Majid MS, Ahmad HS, Bizhan H, Mohammad Hosein HZ, Mohammad A. The effect of Vitamin D supplement on the score and quality of sleep in 20-50 year-old people with sleep disorders compared with control group. Nutr Neurosci 2017;5:1-9. Huang W, Shah S, Long Q, Crankshaw AK, Tangpricha V. Improvement of pain, sleep, and quality of life in chronic pain patients with Vitamin D supplementation. Clin J Pain 2013;29:341-7. Reid D, Morton R, Salkeld L, Bartley J. Vitamin D and tonsil disease – Preliminary observations. Int J Pediatr Otorhinolaryngol 2011;75:261-4. Holick MF. Vitamin D: Extraskeletal health. Endocrinol Metab Clin North Am 2010;39:381-400. Walsh JS, Evans AL, Bowles S, Naylor KE, Jones KS, Schoenmakers I, et al. Free 25-hydroxyvitamin D is low in obesity, but there are no adverse associations with bone health. Am J Clin Nutr 2016;103:1465-71. Fitzpatrick MF, McLean H, Urton AM, Tan A, O'Donnell D, Driver HS, et al. Effect of nasal or oral breathing route on upper airway resistance during sleep. Eur Respir J 2003;22:827-32.